Jonah Hill made how much for Wolf of Wall Street? 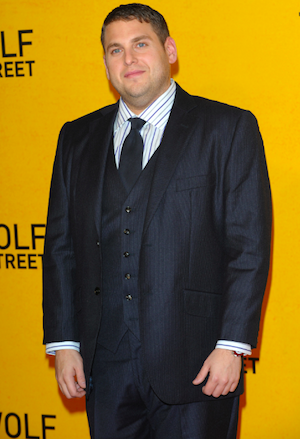 Jonah Hill’s flying high on the success of The Wolf of Wall Street. The film was creatively fulfilling, but didn’t exactly line his pockets. Jonah Hill stars in one of the most talked about films of the year: The Wolf of Wall Street. It’s the latest feature from legendary director Martin Scorsese that reunites him with frequent collaborator, Leonardo DiCaprio. In the film, Hill plays DiCaprio’s wingman and his performance earned him his second Academy Award nomination. Actors are known for scoring huge paychecks (compared to the Average Joe) for their work. But Hill recently told The Howard Stern Show (via Us Weekly) that he made the bare minimum. The actor confirmed, “Yeah, for an almost seven-month shoot.” But Hill’s not complaining. He would have done anything to star in a Scorsese film. Plus, $60,000 for seven months is still more than what some people make for a whole year. So he’s not exactly hovering over the poverty line. That’s why Hill clarified, “It’s not about money for me. None of this s**t is about money,” he said. “I want to make money to pay my rent, and hopefully have a family one day and have kids and stuff.” It turns out this isn’t the first time the actor’s gone for quality over quantity. He was previously offered roles in Transformers and The Hangover, but opted for an indie project instead.